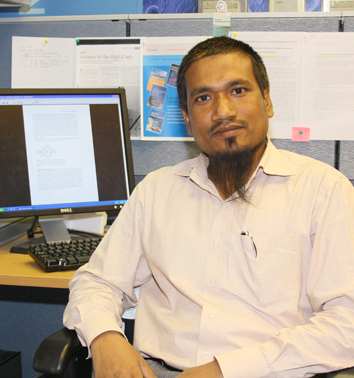 Dr. M. Naziruddin Khan completed his graduate and post graduate degree in Physics (Laser and Spectroscopy) from Department of Physics, Faculty of Science, Jamia Millia Islamia (A Central University) New Delhi-India where he gain his PhD degree in 2002 with worked on Infrared studies of PAH molecules in view of astrophysical problems. He had worked as Guest lecturer (2003-2004) in the Department of Physics, JMI, ND-India, Lecturer (2004-2006), Al Falah Engineering College, (Now Al Falah University) Faridabad-Haryana, India. He joint as Research Assistant in Department of Physics and Astronomy, KSU (2006-08). Currently he is working as Researcher in King Abdullah Institute for Nanotechnology, King Saud University, Riyadh since 2008. He is also a co-author in the USA Patents on SILICON–BASED NANOSILICON COMPOSITES AND FABRICATION METHODS. No: US 8,36,779 B2 and a book on Nanoparticles: Properties, Classification, Characterization, and Fabrication ( Nova Publisher). He has published more than 20 scientific publications in different international repute Journals.